The trip this year was in reverse order so the start was in Indiana and from the word go God was again doing His new thing. The annual children’s worship and teaching week was definitely quality and not quantity. For the first time came little seven year old Reegan brought by his great grandmother. Reegan has cerebral palsy, he walks with the aid of callipers on both legs and one crutch, he has a twin brother who is normal and living with his birth parents while they put Keegan up for adoption. The weekend before our start his adoption was finalised by the great grandmother’s granddaughter. Put that aside he is a radiant glowing little boy who I first met last November when in the Good News club in his elementary school I had the privilege of praying for him to receive Jesus. He recently told his great-grandmother that since November he has felt great all-over. He was so hungry for God, the first night his hand was up to receive before I had even finished explaining what we were praying for then up again when I had finished. After praying for him with a glow on his face he said, “My heart feels wonderful.” His adoptive mother is not walking with God so he’s not fed all the right wording so what he describes each time is exactly what he feels as he has real experiences with God. At the end of the meeting God gave him an amazing prophetic word, not for healing but experiences he is going to go through with God and the ministry that will lead him too, this had him bouncing on his seat.. The next night he was out again and this time, the presence of God hit him and he had to be assisted to his seat saying “this is amazing, this is amazing”. It was also Kynan’s special time when he was very young his mother was sent to prison for several years and he coped with it by locking up his heart. For years he has had an expressionless look on his face and denied who he is by always role playing some mystical super hero. He could go through a whole week of meetings and not respond once and if on an occasion he did when you laid hands laid on him you could feel him resisting. Not this time, he was out for prayer every night, there was no resistance, his face changed a degree each time until the third night when while praying for him God gave him a prophetic word which he acknowledged. As I was praying for him I suddenly saw him without me telling him too hold out his hands open them, symbolically giving God the key to his heart. When I finished praying his face for the first time in years looked normal. The rest of the time he was out for prayer almost every day and now you could hug a normal boy and not a lamp post. The two boy’s in training Ethan now thirteen and Andy fourteen again made new steps by moving into prophetic praying. It began when we were speaking at a family service in a neighbouring church when the pastor and his wife came for prayer. They said nothing but when they had finished the pastor grabbed the microphone and said, “Wow that was amazing they knew nothing but were spot on.” Another lady who had come out for healing came afterwards with tears down her face saying they had prayed for her need but then went on to pray about things they knew nothing about. Later on Sunday at the host church even though a lot of adults were out for prayer I felt they had to pray together for each one as they are more effective that way. This time I watched the faces of those being prayed for and for everyone there came a point when huge smiles came across their faces, clearly the point the boy’s became prophetic. The teaching we did three way with my goal that in November I will do much less, them more to the end they do it all. In fact the pastor and I are looking forward to the day when we sit in the service and do nothing and the service is taken completely by three young people. The pastors youngest daughter, fourteen has been helping her father with worship for some time but been very shy about it. She too made new steps this time and on Sunday she was singing and playing her guitar out loud equal with her father for the first time. I had probably one of the best times in the Christian school for a summer break, the children’s hearts are now well prepared for the week I will spend with them in November. God has given me a bonus too, the principle asked me for November if I will also have a meeting with her teachers to teach them how to reach and lead children spiritually. She wants to be more effective in following up after my visits as she now looks on my visits as us partnering together in the ministry in her school, I find that a great honour, praise God. Bolivia began with a challenge when I arrived and my luggage followed forty-eight hours later. That no way affected the continuing flow of God’s spirit and blessing. 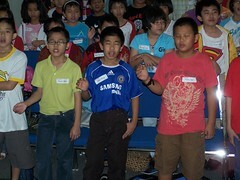 In the orphanage (The Arc) there are eleven new boys this year all rescued from a Roman Catholic home that has closed. Those boys aged six to eight to compound the bad start they had, had in life they had never gone beyond the grounds of the home from the moment they entered it and the only ones who got attention from the staff was the one who shouted the loudest. Church meetings to them were something ritualistic and boring so a place play up as much as they could. The staff in the Arc have worked hard with them and in the second meeting, almost all of them responded for salvation along with some of the original ones who needed a spiritual clean up. From then on they were glued to every word and out every time for prayer. In the church family services, they told me in advance that the people had a real high expectancy for God to move and He certainly didn’t let them down. For reasons beyond any ones control my visit had to be at the end of July rather than the beginning, the beginning is a school holiday. In spite of school the next morning they were in the meetings every night in bigger numbers than usual and their children there too. The responses from those for prayer from all ages was bigger, faster and more enthusiastic than ever. There were two special meetings. One when I spoke at the opening meeting of a youth camp in the foothills of the Andes. We sat in the open air on big logs around a campfire, cold on your back and warm on your front and the oldest boys from the Arc were among those there. When it came to the prayer time all but one stood to their feet, I prayed then as God gave me one long prophetic word for them all an awesome feeling of the presence of God feel like God giving them hugs. The second in the arc when God was giving words to three of the original boys who are among the most vulnerable and needy there but ones so desperate to walk close to God. Each word was different though about His love for them and more. As I gave each their word they moved their head forward and tucked it into me as if they were receiving that hug from God, their faces were radiant as they left the front.